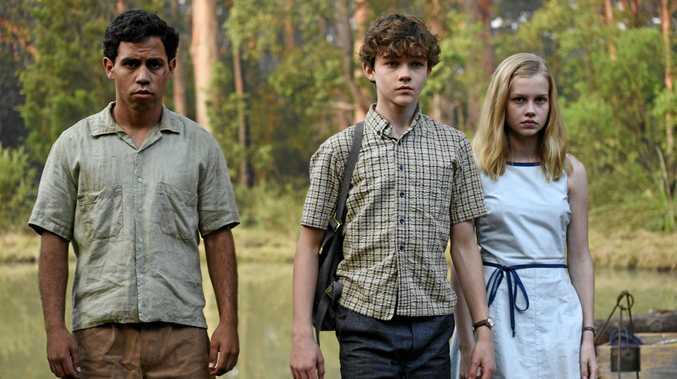 Jasper Jones, played by Aaron McGrath, Charlie Bucktin, played by Levi Miller, and Eliza Wishart, played by Angourie Rice, in a scene from the movie Jasper Jones. ON THE surface, small Western Australian town Corrigan seems like countless others across the country. But dig a little deeper and there are dark secrets being hidden that will come to a head in the film Jasper Jones. The movie, based on Craig Silvey's book of the same name, follows Charlie Bucktin, played by Levi Miller, a bookish 14-year-old growing up an only child in rural Australia, in 1969. It is a time of great social change - the Vietnam War is raging, there is increased demand for women's rights and the country recently voted to count Aboriginal people in the Census. Charlie seems to have been sheltered from the trouble in the world around him, but his youthful innocence is shattered when Jasper Jones (Aaron McGrath), an older boy born to an Aboriginal mother and white father, taps on his window in the middle of the night asking for help. 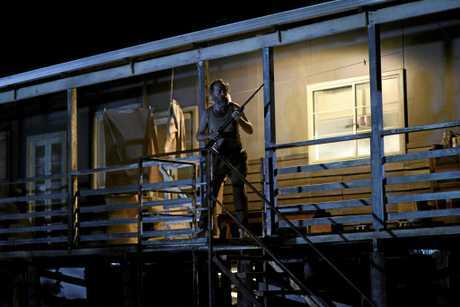 Jasper takes him to a clearing in the forest where his girlfriend, Laura Wishart's lifeless body is hanging from a tree. They can't go to the police, Jasper says, because everyone will blame him, the Aboriginal outcast. Charlie believes Jasper didn't kill Laura, so he helps him hide the body. The two then embark on a mission to find out who did murder her. Jasper Jones is beautifully shot and the town of Pemberton in Western Australia provides the perfect backdrop for the film told by a powerful cast of young stars and Australian veterans of the screen. Levi Miller and Angourie Rice in a scene from the movie Jasper Jones. Despite their age, young stars Miller, McGrath, Angourie Rice (Laura's sister and Charlie's crush, Eliza) and Kevin Long (Jeffrey Lu, Charlie's best mate) give powerful performances and drive the narrative of the film. But for what may at first seem like a family-orientated tale, Jasper Jones tackles some incredibly dark themes, and without spoiling the ending, I'd advise parents to read about the book's plot pretty carefully before taking their children to see the movie. This one is better aimed at those in their mid-teens. It's not that the film's messages aren't important - they're crucial - but be prepared for a few frank family discussions about what you have just watched. Despite the darkness, there is plenty of light as well. The bond between Charlie and his mate Jeffrey offers a few laugh-out-loud moments and the relationship between Charlie and his father, Wes (Dan Wyllie) is particularly touching. Toni Collette's performance as Ruth Bucktin is solid as ever, and Hugo Weaving helps viewers put the pieces of the puzzle together in a powerful way in his role as Mad Jack Lionel. Despite being set in 1969, viewers will be left with the question of how different things really are today, and perhaps in that way, Corrigan is more like modern country Australia, and the country as a whole, than we would like.